Sometimes, you may delete your iPhone photos by accident, and these photos are really important for you. And here is a step by step guide will show you how to recover your iPhone photos. This tutorial is easy to follow, even you are computer idiot can understand it. Please pay attention: Don’t sync your iPhone with iTunes. And then set your iPhone into the flight mode and don’t use it until you find those photos. This will increase the ratio to retrieve your iPhone photos. The tool you need is this iPhone Photos Recovery. This program has both Windows Version and Mac Version, and this guide is based on Windows Version. And we took iPhone 5 as example. Now, let’s start the guide. Step1. 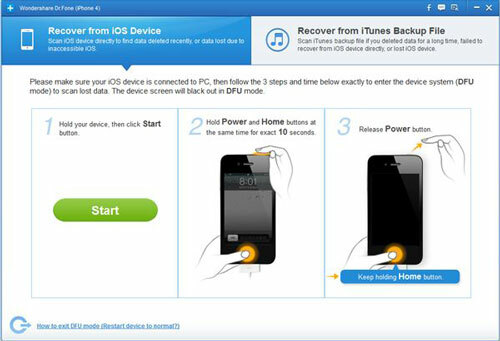 Download iPhone Photo Recovery and install it on your computer, Plug in iPhone to computer. Then you’ll get the main interface as follow. Step2. You have to set your iPhone into DFU mode to let the software scan your iPhone. 1). Hold your iPhone and click “Start”. 2). Press “Home” and “Power” button at the same time when you click “Start”, and hold for 10 seconds. The iPhone Photo Recovery will count it for you. 3). After 10 seconds, release “Power” and keep pressing “Home” for another 10 seconds. 4. When you’re told that you’ve successfully entered the DFU mode, the iPhone photo recovery will automatically scan your iPhone for data as follow. Step3. After the scan, the iPhone photo recovery will return a list of all the photos on your iPhone, including the deleted photos. Now you can preview the photos and choose the photos you want to retrieve. And then click “Recover”, that’s all. When the process is finished, you will find the deleted photos back on your iPhone.